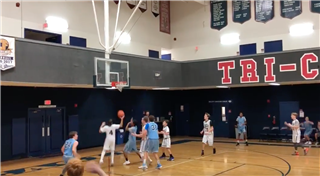 The Boys MS - A Basketball team was down 3 points against Tri-City Christian on January 20. With 7 seconds left on the clock, Gibson Witz made a great play to knock the ball away, Brady Burman passed it to Reid Celestin, who almost drove for a layup but quickly decided to kick it back to Brady for a deep 3-point shot at the buzzer! The Firebirds took the win in overtime thanks to a free throw, also by Brady!